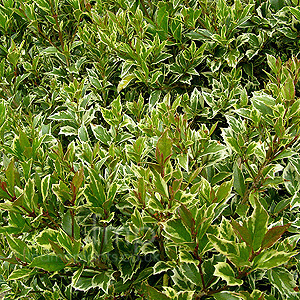 This variegated Osmanthus makes a great low growing and compact alternative to an ornamental holly, especially in a smaller garden. It is a naturally compact shrub with outstanding foliage and form. It produces flowers but these take the back seat to the outstanding luxuriant deep green gold edged evergreen foliage which provides outstanding all year colour. Great in a mid border location or in a large pot or tub. Cultivation tips: Plant this distinctive low growing shrub in full sun or light shade. Avoid planting Osmanthus in very exposed, cold or hot dry areas, preferring a moist fertile soil in a sheltered spot. Trim to shape as necessary into an attractive dense evergreen shrub. Mulch with compost every few years to feed. Ideal for container growing or planting on mass for ground cover. Great as an alternative to variegated holly.